Hangzhou is a medium sized Chinese city of about 10 million. We spent two weeks there recently on a stay arranged by Gisele’s sister Angela. 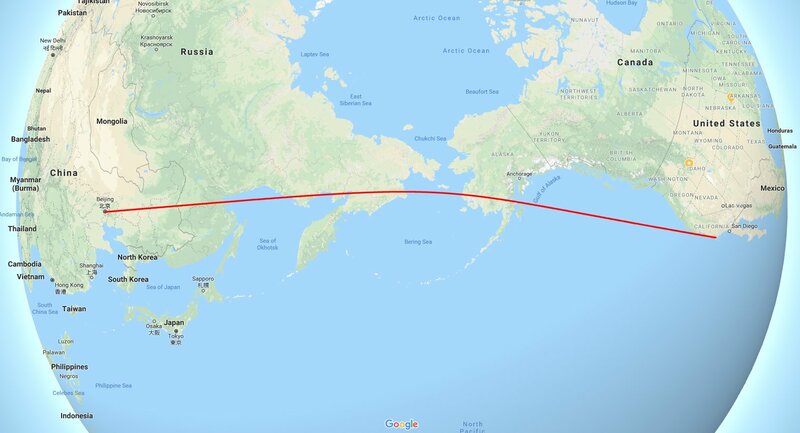 The flight from Los Angeles to Beijing went over Alaska and Siberia. (Actually the Great Circle crosses over the Alaskan peninsula and the Kamchatka peninsula, but for some reason the flight went well north of that path. Could be weather, winds or political.) Hangzhou is south of Beijing, near Shanghai. 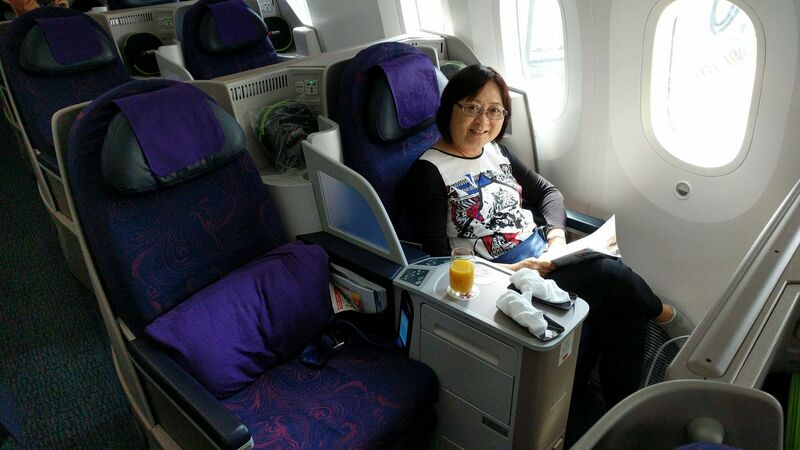 Air China’s business class seating is quite nice. Gisele had to climb over me to get out when I was fully reclined, but otherwise pretty good. The food was excellent. This made the 12-hour flight endurable. Gisele’s sister Angela arranged for this apartment, where we stayed with Angela and Gisele’s brother TaChuan. 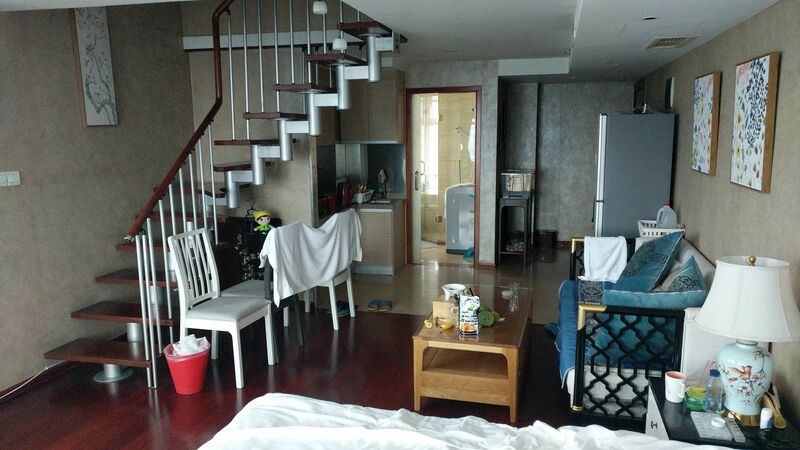 Gisele and I had our own room upstairs, but Angela slept in the main room downstairs (you can see the corner of her bed at the bottom of the picture), TaChuan slept in a nook upstairs, and we all had to share a single bathroom. That’s my bath towel hung over the chairs — there weren’t enough towel racks in the bathroom for everyone. At least twice I had to ask Gisele to bring my towel to me as I forgot to take it in when I showered! The apartment was on the 17th floor giving us some nice views of the city. This was sunset on our first or second day. 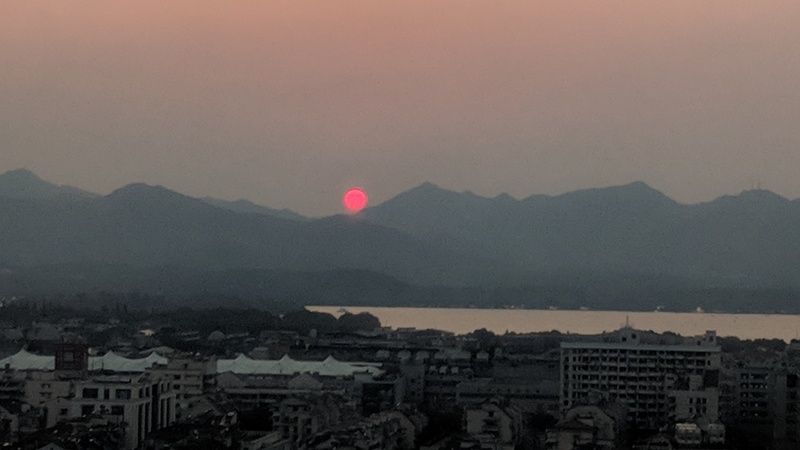 The sun really did look that red. You can see West Lake, famous throughout China with lots of history. 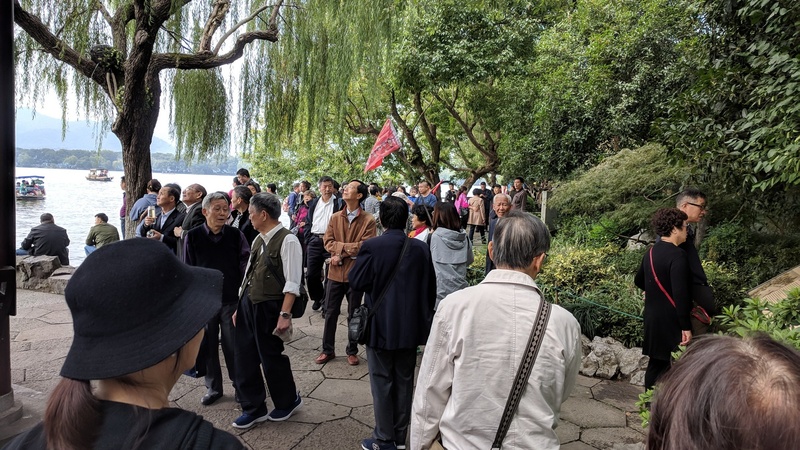 There is a green belt all around the 2-mile diameter lake and it is very popular to visit for both residents and tourists. 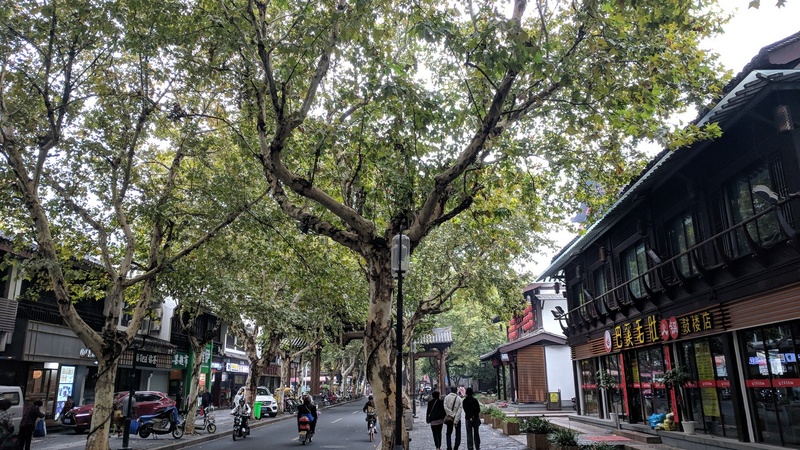 Hangzhou is a busy city in places, but there are lots of very pleasant streets such as this one, lined with sycamore trees. That’s Gisele, TaChuan and Angela walking in front of me. 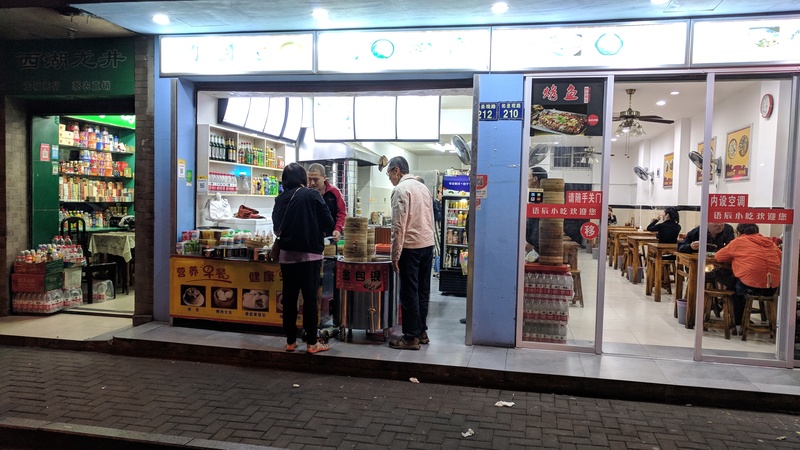 Gisele and TaChuan buying steamed buns at one of countless little shops in the city. 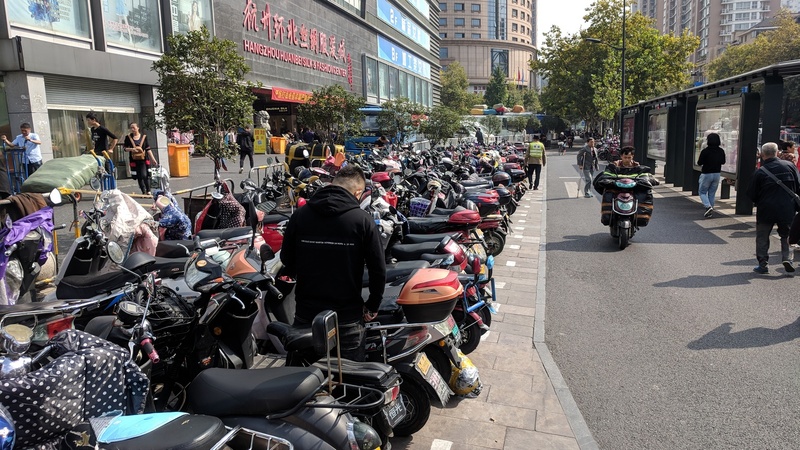 There are more scooters than cars in the city, but in the two weeks we were there we never saw a gas-powered scooter. They are all electric by law. On the one hand it made the air a lot cleaner. But it was dangerous too, as scooters often drive on the sidewalk and you couldn’t hear them coming up behind you until they blasted on their horn. Horn use was very common; too common! We were told that batteries gave about 30 – 40 miles of range, and the top speed by law was about 30 mph. 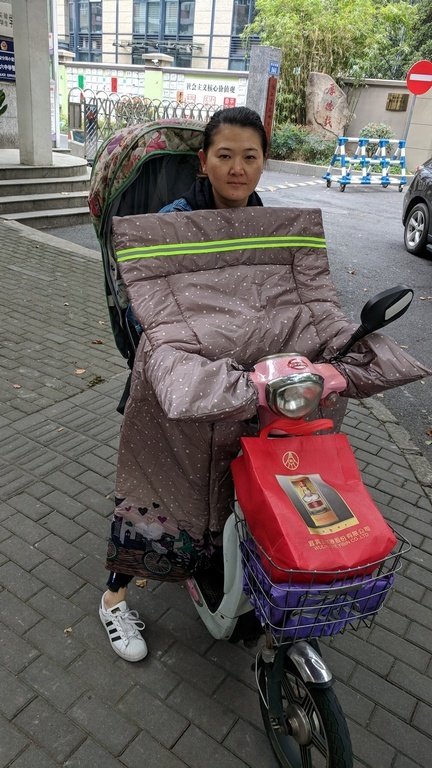 If a scooter is your main mode of transportation, it is nice if you can stay warm in the winter. Many people wear these “scooter jackets” (my name) while riding around. When it rains, they can cover them with a rain coat to keep dry. She may not look too happy, but she gave me permission to take her picture, and actually smiled a little just after I snapped it. No visit to China is complete without a banquet. Chinese love to eat! The child, man and woman on the left are friends of Angela, and they insisted on treating us to this nice meal. We had a private room and lots more food that we could eat. 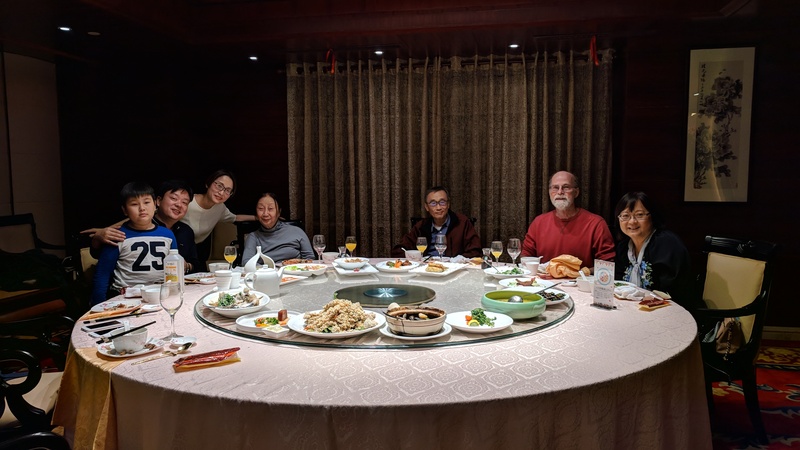 I ate some of almost everything — there were no duck livers or sea cucumbers on the table. We took a boat ride out to an island in the middle of West Lake. The island itself was beautiful with green, luxuriant vegetation, but the crowds made it almost impossible to enjoy. We walked around to the far side of the island and it was better, but still impossible to be alone. That’s a major issue for me when visiting China. There are too many people and as prosperity increases, more and more of them have free time and are traveling. 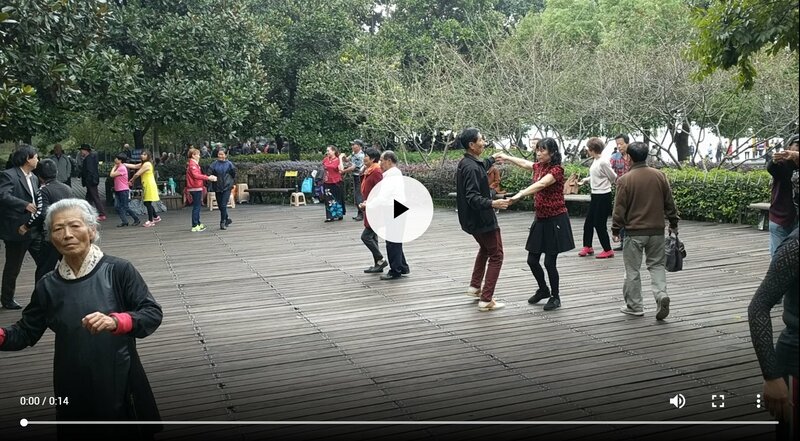 We came across these dancers in the park around West Lake. Notice the cute little lady in the foreground without a partner. Click to play. It was an interesting trip. Angela has an expression in Chinese that I will try to translate: She prefers to be a “stayist” rather than a “tourist”. Meaning, rather than zipping through lots of places on a tour, she would rather stop in one place for a while and get to know it. I can certainly appreciate that. 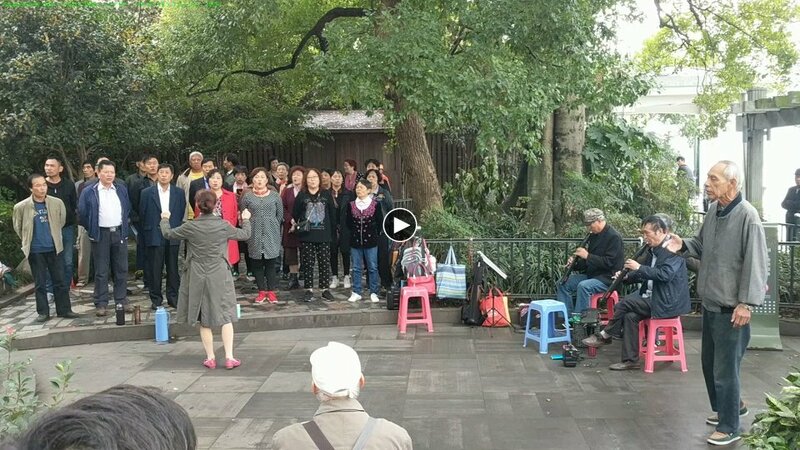 We visited Hangzhou 20 years ago on a zip-through tour, and it is blurred together in my memory with many other Chinese cities. But this time I know it much better and have more feel for what it is like to live there. I traded my 2-year old Pixel XL for a new Pixel 3 XL three days ago. Bottom line: My Pixel XL battery would only last 4-5 hours on a charge, so in that respect the 3 is a big improvement, lasting pretty much all day. Otherwise the upgrade probably wasn’t worth the $700 or so net cost after trade in and store credit. The camera has some cool features that I will probably never use, though I’m eager to try the night vision feature that hasn’t been released yet. But I think that and most of the other software features might eventually be released for the original Pixel too. 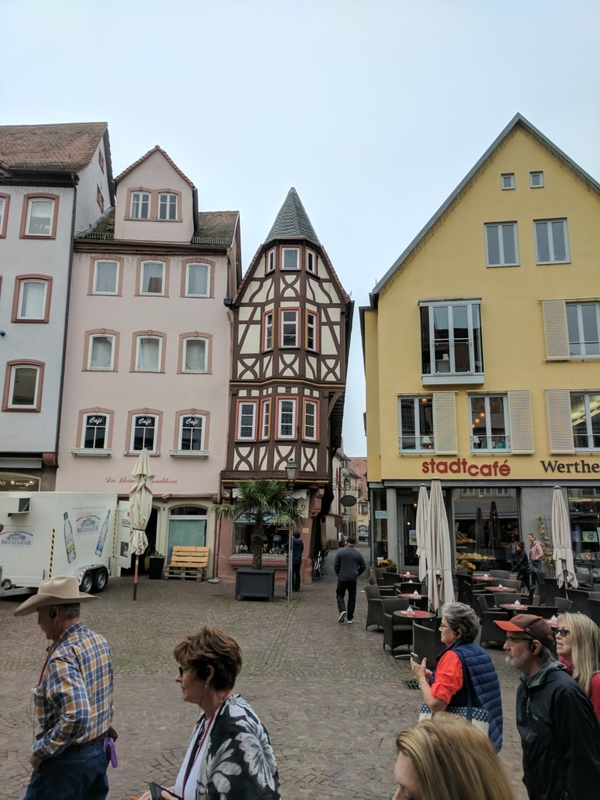 Photography experts compare side-by-side pictures and point out how much better the Pixel 3 pictures are compared to almost everything else, talking about bokeh and other arcane stuff, but honestly I can’t see much difference. Yes, if I look closely I can see that they are not the same, but better? Not sure. I’ll take their word for it, though. Again, the night feature might change my mind on that. It’s a nice phone, and it does what it’s supposed to do. We drove to Southern California in my new Tesla Model 3 to attend my niece’s wedding. The trip was more interesting than usual because of some of the unique features of the car. Here are a couple of notes. The hotel had free charging, so we got to top off the battery there. On the way back we stopped at the Outlet Mall in Cabazon and while we were shopping we got warned that we were going to be charged idle fees since more than half the chargers were occupied and our car’s charging was complete. I think I got back in time to avoid the idle fees, and I don’t mind the policy. It should make it more likely that a charger will be available when I need one. We were going to stop and eat at Carl’s Jr in Quarzsite again, but decided to go upscale at Denny’s in Blythe. But we still needed to charge again in Quartzsite, so we sat in the car a few minutes, then went in to use the bathroom and bought a cup of coffee. So in summary, two charges each way of 15 – 20 minutes each, at convenient places to take a break. Auto Pilot worked well, most of the time. I didn’t trust it too much in heavy traffic, or with sharp curves, but on the open highway it made driving a lot more relaxing. I got pretty relaxed and depended on it to keep me in the lane and a safe distance from the car in front. It will even change lanes automatically if you turn on the turn signal. That sounds like a small thing, but it means you don’t have to disable AP, change lanes, then re-enable it. One simple step instead of 3. When I first got the car, it felt like it pulled wide, almost over the line, on curves. That behavior is much better now, and it stays centered in the lane even on pretty tight curves. I am looking forward to continual improvements and enhancements to the capability. At some point it should look at the navigation system, for example, and determine which lane it should be in, and transition from one freeway to another. I haven’t had a chance to try self-parking yet, but that’s supposed to work pretty well right now. I caught some interest on the trip, mostly from Gisele’s friends and family, and her brother’s neighbor who came over to see it while we were getting ready to leave this morning. I saw lots of other Teslas at the charging stations, but didn’t see a single other Model 3. They are still rare enough that people are interested. There’s something about an electric car that just seems right. Low maintenance, no pollution (other than at the power plant…), cheap operation, excellent handling and performance. It’s just a lot of fun to drive. I’m sure that as I get used to it, the drive to LA will again become boring and tedious, but for now it is interesting. I got my Tesla Model 3 yesterday, and Gisele and I took a drive up to the Mogollon Rim today to spend the afternoon with Richard, Dianna, Dale and Donna. It was very pleasant up there, though windy. Dianna made a delicious lunch for us of BBQ chicken, fruit salad and other fixings. I’m so full I think I’m going to skip dinner! The car is lots of fun to drive, unbelievable acceleration and the autopilot works quite well. I would have had enough battery to get there and back, but I gave some joy rides and then charged in a 240V outlet for a couple of hours. We made it back with 84 miles of range remaining of our nominal 310 miles. I noticed a couple of interesting quirks and/or features with the autopilot. – It tends to crowd the outside of the lane on curves, never actually crossing the lane marker, but getting close. Makes me nervous when there is a car next to me, since many people tend to hug the inner edge of the lane on curves. – It is supposed to auto lane-change by holding the turn signal. It didn’t work at all on Highway 87, even though that is a 4-lane highway. But it did work on Loop 101 in Tempe. With a little research I found that the car knows when you are on a real freeway and only actuates auto lane change there. – This one was a real surprise: Coming down from the rim north of Strawberry the speed limit is something like 45, but there are several hairpin curves with 20 mph warning signs. I let the car approach one of these turns and noticed that it was slowing down by itself, even though cruise control was still set for 50. It actually seems to know where the tight curves are and slows down for them. Autopilot is very cool, and continuously improving. I wouldn’t take a nap with it yet, but it makes the trip a lot more relaxing. Here’s a story of a large technology company. The security department came to the CEO and warned him that their servers had been hacked by a competitor and proprietary information had been stolen. The CEO pooh-poohed the claim, and said that even if they had been hacked it could have been anyone, not necessarily the competitor. And he emphasized that he had nothing to do with it. He gave no directions to further investigate the situation, prefering to ignore it and claim it was erroneous. A while later the security department came back to the CEO with clear evidence that they had been hacked, and clear evidence that it was that same competitor. Again, instead of responding to the threat to the company, the CEO just keeps stating that he had nothing to do with it, and anyway it started before he took over the company. Again, no plans or even a clear intention to respond despite strong warnings from the security department that the hacking was ongoing and would continue. What would happen to this CEO? Wouldn’t the board vote him out immediately? Wouldn’t it be obvious that he doesn’t have the best interests of the company at heart, but rather is just concerned with how he looks and with deflecting any blame for the situation? Some people might even suspect that there were shady connections between him and the competitor. Of course, this is only a story. Nothing like this could happen in real life. No one could rise to the level of a large company CEO without demonstrating much stronger leadership abilities than this. Apollo peacefully left us this morning. 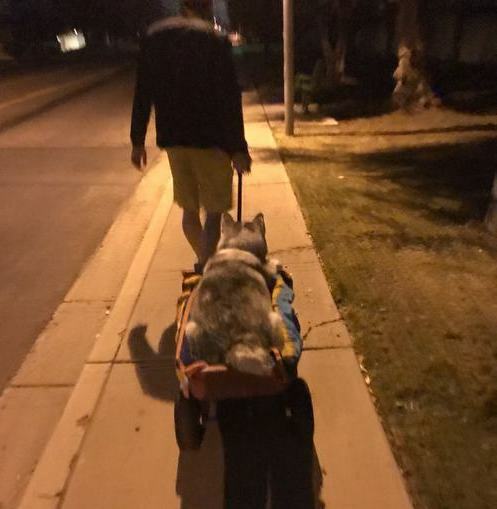 After 11 years of joy and companionship he passed away in the veterinary’s office. 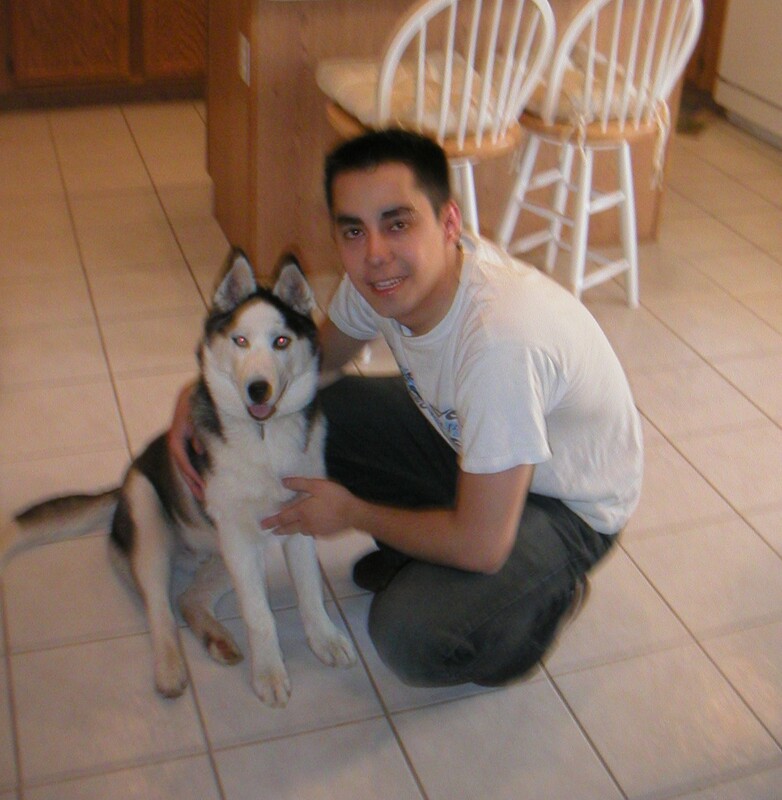 He was lucky to be adopted into our family, and especially to have Derek as his “father”. 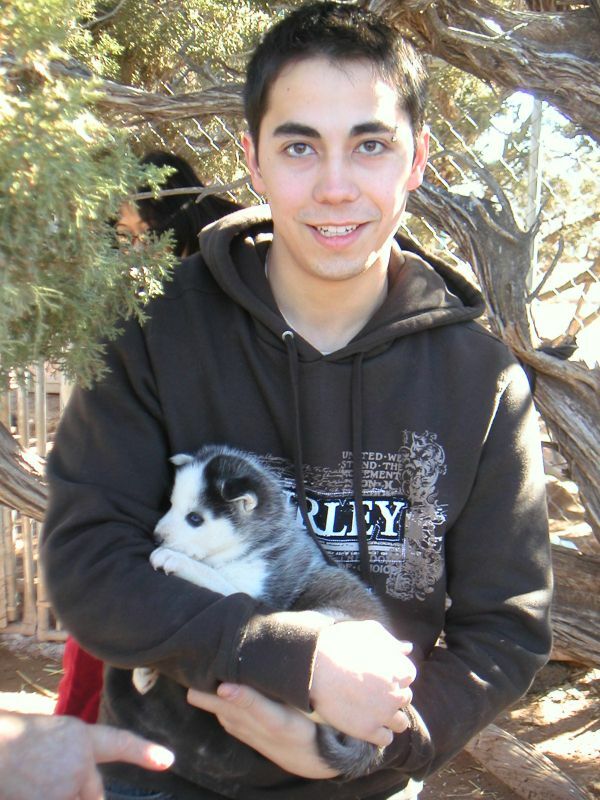 Derek took as good care of him as anyone could have, spending more than a little time and money to keep him as healthy and happy as possible. He had a good life. It was also an eventful life, with more than a couple of problems, including epilepsy, pancreatitis (which almost killed him 5 years ago), valley fever, and finally in the last year cancer. The cancer was detected as several growing areas in his lungs, but the vet said it looked like it had come from somewhere else. 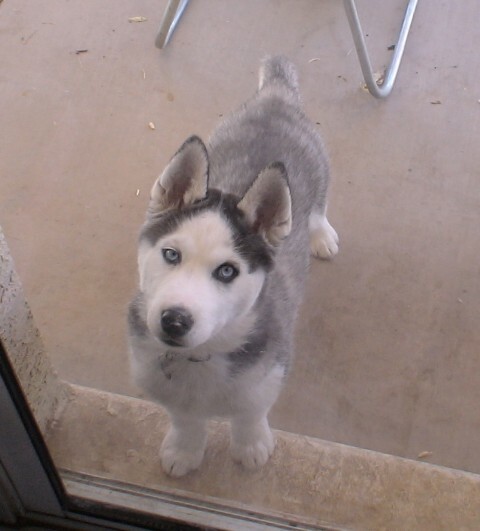 Despite all these problems, he was always friendly and cheerful, never known to bite (except a few nips when he was a puppy!). He came to our house this last Christmas morning, the last time he was here, and actually ran a few steps in the back yard playing with Derek. But the past couple of days he wasn’t able to eat, stand up or even hold down water. Everyone agreed that it was time to end his suffering. Here are a few pictures of his life. 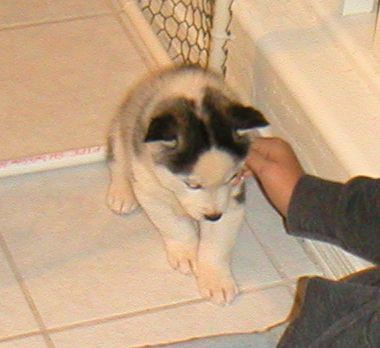 Not quite ready to leave his mother, this was a couple of weeks before we brought him home. His first night at our house. He cried much of the night, but ended up in bed with Derek. About 12 weeks old. I left this picture off the original post, but had to include it once I saw it. Growing, but still not full size. 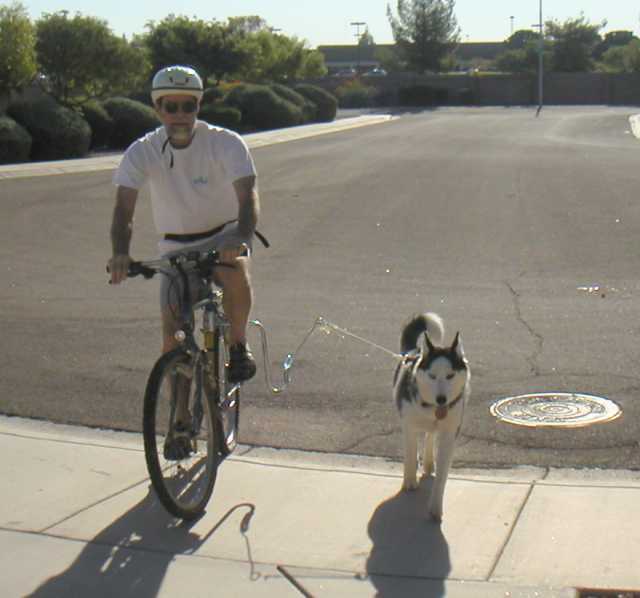 In his prime he could pull the bicycle along, just like a sled dog. Derek took him for a “walk” last night near his house, and then this morning around the lake near our house where he used to walk. He could no longer stand on his own. Goodbye, Apollo. We will miss you. I was lying in bed a couple of nights ago when a thunderstorm came through. I heard the far-off rumbles of thunder, lasting a few seconds each, until one lightning bolt struck within a few hundred feet with a huge boom! The loud rumble went on and on, at least 10 seconds before it quickly faded away. It started me wondering, there in the pre-dawn hours, why the rumble lasted so long for that strike. It wasn’t an echo; there was nothing nearby to echo from. It wasn’t that it just seemed to fade more slowly just because it started louder — the end of the rumble was still quite loud and I’m sure if I had been further away I would have still heard it. And it died off pretty quickly; it wasn’t just a fade away. Why 10 seconds or more, when more distant thunder lasts just a few seconds? And then I had the following thoughts, illustrated below. 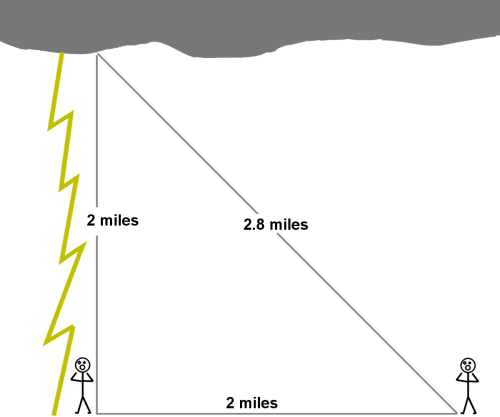 A lightning strike is almost instantaneous, super-heating the air near the cloud and near the ground at almost the same instant. This super heating is what causes thunder as the expanded air sends out a tidal wave of sound. At the ground, I heard the sound emitted from the bottom of the strike within a second or less, as I was quite close. But the top was maybe a couple of miles up, at 10,000 feet or more. Sound travels around 1000 feet/second, so in the first second sound from the bottom 1000 feet arrived, during the second second sound arrived from the second 1000 feet, etc., so that finally it took 10 seconds for the sound from the top to reach me. All during this time I was hearing a continual rumbling as sound from an ever higher portion of the strike reached my location. Now what would someone have heard who was about 2 miles away from me? The bottom of the strike would be 2 miles away, so it would take about 10 seconds for the first sound to reach him. By the Pythagorean theorem, the top would be about 2.8 miles away, so that would take about 14 seconds to reach. For this observer, the thunder would only have lasted about 4 seconds. For someone further away, the duration would be even less (4 miles away would be about 2.5 seconds, for example). So I think that explains why the rumble from thunder lasts much longer when the strike is close. It reminds me a little of the theory of relativity, where simultaneity and duration are different for differently moving frames of reference. In this case, the event is interpreted as having different duration for different observers. Of course the underlying theories are quite different, but it still strikes me as an interesting parallel.